Penny says her avatar is in both images. I found her in the top image. Click, it enlarges. But, have yet to find her in the bottom image. Whatever, her point is with proper scaling of a build and altered camera settings we can make much more use of Second Life. She also shows how to get a 2048sq.m. parcel that usually costs US$15 per month ($180/yr) for only $3.71 a month ($44.52/yr). I’m not sure what L$ to US$ conversion rate she used, but one might beat that price using limit sales. Read her article to see how that is done. One of her points is, if the Lab was showing people what land actually costs and what they can do with it, more people would likely be buying land or at least Premium Memberships. She has me thinking about it. She makes a good case for how mesh can greatly reduce tier cost. 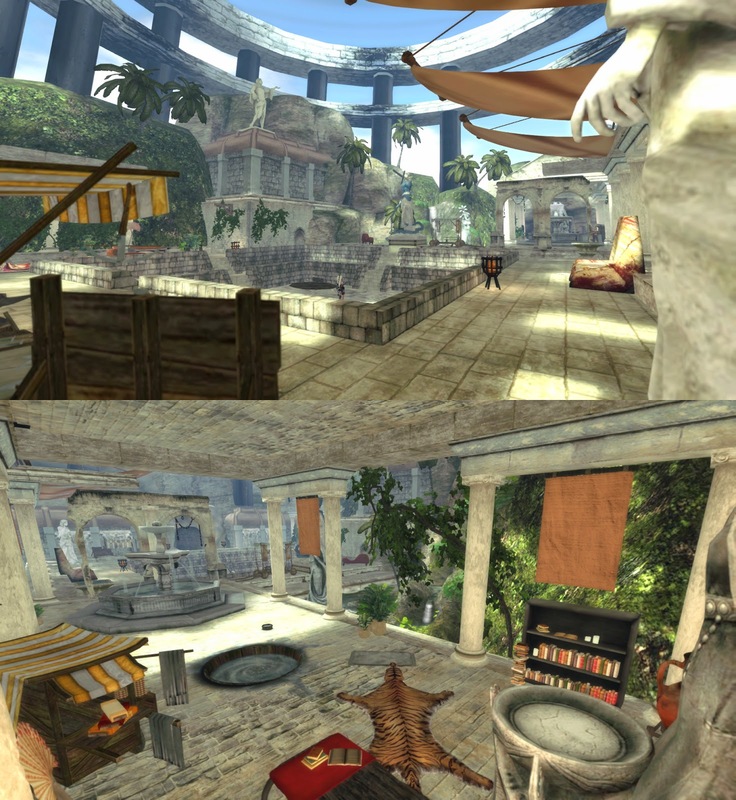 This entry was posted in Mesh, Second Life and tagged Land Impact, Scale in SL. Bookmark the permalink. I can testify to what Penny says, although being a prim addict I have a full region+ on the mainland. On that land I have 5 homes with lots of detailed clutter to make them feel livable, innumerable little hangouts and a club. There are still prims to spare! All of this would not have been possible just a year or 2 ago. First Convex hull cut the land impact for most prim builds in half. Sculpties can be scaled up to 64M and still cost 1 LI. Finally Mesh has allowed talented creators to make objects equivalent to dozens of prims for 1 LI. My only caveat is that if you take full advantage of the building possibilities people with low end graphics cards or weak internet connections may not be able to appreciate it.